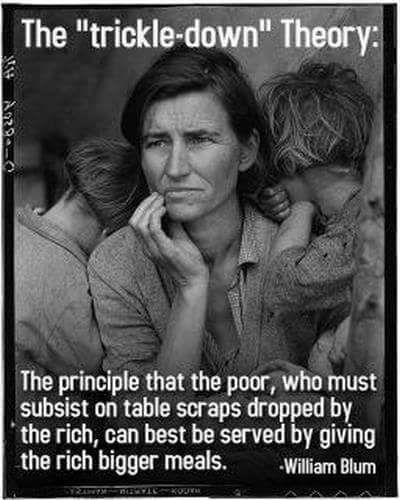 This entry was posted in Hunger & Poverty, News & Views, Quotes and tagged bigger meals, hungry, inequity, poor, principle, rich, subsust, table scraps, trickle-down theory, wealth, William Blum on April 13, 2018 by Ray Buchanan. The man in the offal office controls the Executive branch of the government. His party controls both the Senate and the House of Representatives, and the Supreme Court leans right, as well. And #BLOTUS still whines about the obstructionist Democrats. He has been in office for almost a full year. Just what exactly is his definition of making America great again? 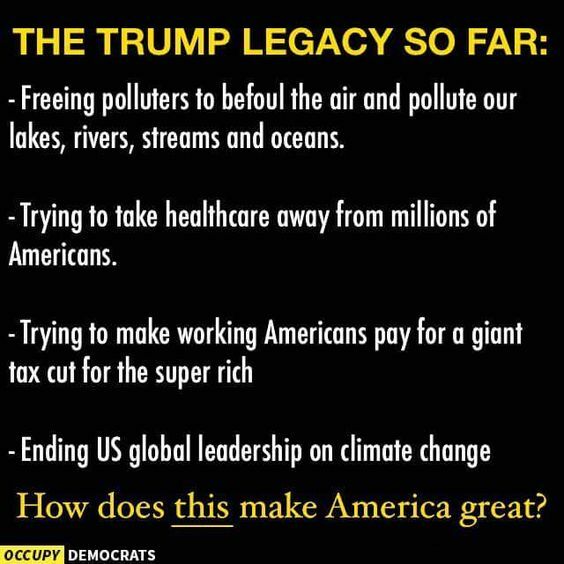 His tiny legacy, like everything else connected to him is a shameful failure that demonstrates a dangerous lack of morality and an egotistical focus on personal greed. 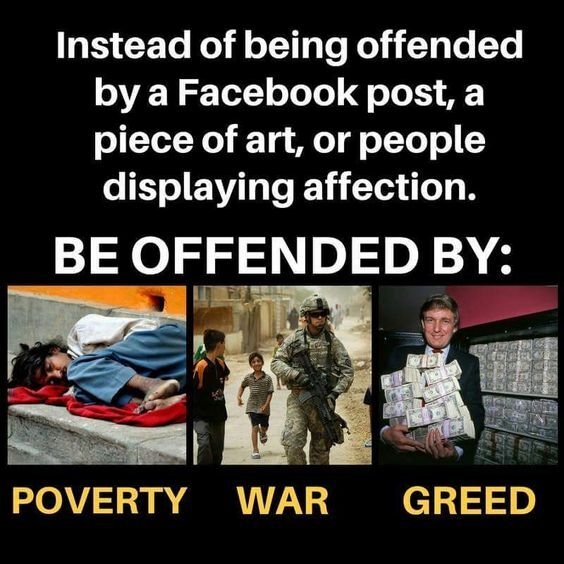 This entry was posted in Facts & Statistics, News & Views and tagged BLOTUS, climate change, Congress, dangerous, egotistical, Executive Branch, global leadership, greed, healthcare, legacy, MAGA, morality, Occupy Democrats, Offal Office, pollution, poor, powerful elites, Republicans, rich, shame, Supreme Court, tax cuts, wealthy, working class on December 17, 2017 by Ray Buchanan. The Republican Tax Bill is another gigantic lie. Our president is desperate for a political win, and the Republicans in Congress refuse to demonstrate they have the morals to do anything but pay off their mega donors. 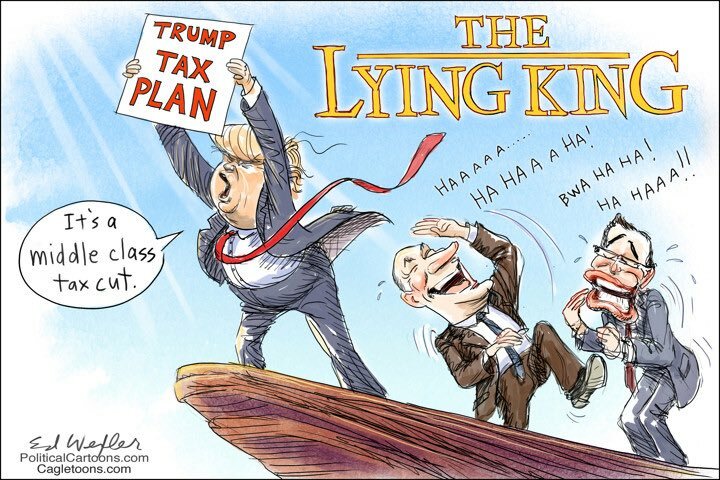 Liar-in-Chief, #BLOTUS, the Lying King, whatever he is called, the truth is that the man in the Offal Office is a pathological liar unfit to to do anything but run with the hyenas. He is actually afraid of the truth, and flees from it like vampires flee from sunlight. If he wasn’t so dangerous it would be funny. But, the reality is this man is a true threat to democracy. It’s time for all citizens to realize what he is doing to destroy the values we have long lifted up to the world. This entry was posted in News & Views and tagged billionairess, BLOTUS, com, Ed Wefler, fear, hyena, Liar-In-Chief, mega donors, middle class, Offal Office, Political Cartoons, Republican Tax Bill, rewards, rich, sunlight, tax plan, tax reform, the Lying King, Trump, truth, vampires, wealth on November 29, 2017 by Ray Buchanan. This is one of those beautifully simplistic, yet absolutely true definitions that I love. During these never-ending tax cut debates, it is worth remembering that Warren Buffet once said. According to Mr. Buffet, we could have a balanced federal budget anytime we want one. His solution is as simple as the definition above: No member of Congress is eligible for reelection if they are seated in a year when our budget has more than a 3% deficit. Sounds good to me. What do you think? This entry was posted in Hunger & Poverty, News & Views, Quotes and tagged art, campaign funds, Congress, deficit, definition, Oscar Ameringer, politics, poor, promises, protection, reelection, rich, votes, Warren Buffet, wealthy on November 22, 2017 by Ray Buchanan. 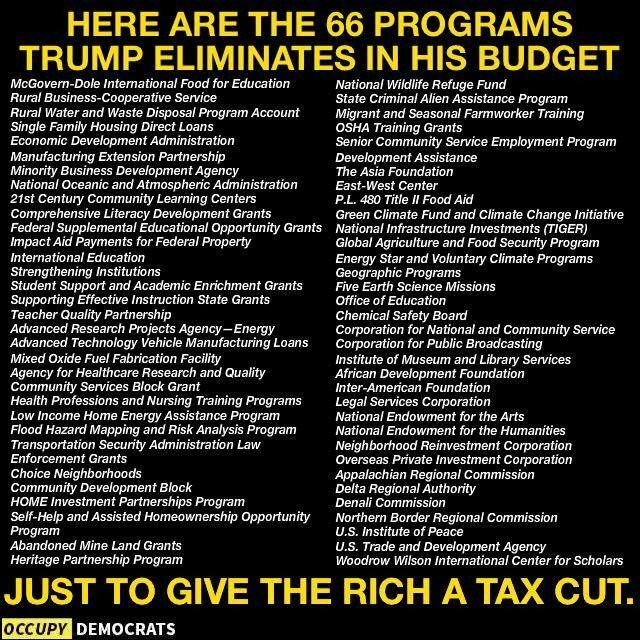 I am not familiar with all these programs. Some may need to be cut or scaled back. I just want to address two that I know well. The first one on this list, the McGovern-Dole International Food for Education is one of the most effective and powerful programs the US has for helping end hunger in our lifetime. This is a program that deserves far more funding, not less. And it certainly should not be cut. Adopting this is a shameful exercise, clearly aimed at making the rich richer at the cost of the social responsibility our country has always demonstrated as a global leader. Such cuts are morally repugnant, like the one proposing them. Caring citizens should do all in our power to oppose such a budget. This entry was posted in Facts & Statistics, Hunger & Poverty, News & Views and tagged buget, citizens, food, global leadership, malnutrition, McGovern-Dole International Food for Education, opposition, PL 480 Title II Food Aid, program cuts, rich, shame repughant, social responsibility, tax break, wealthy on October 27, 2017 by Ray Buchanan. And the Republicans still wonder why they cannot get a healthcare bill to fly…I admit I don’t know about rocket science, but even I know most folks want our government to help us. And in most cases that means not throwing 32 million of our citizens under the bus. 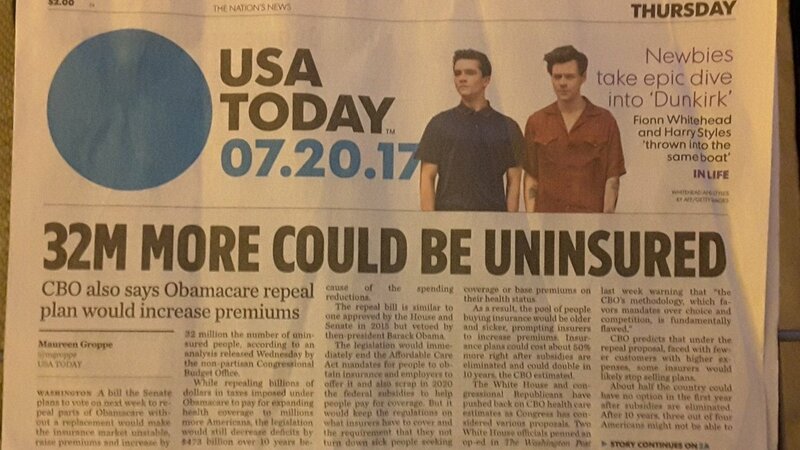 This entry was posted in Hunger & Poverty, News & Views, Quotes and tagged CBO, government, healthcare, help, insurance, poor, premiums, Republican Healthcare Plan, rich, USA TODAY, wealthy, working class on July 21, 2017 by Ray Buchanan. 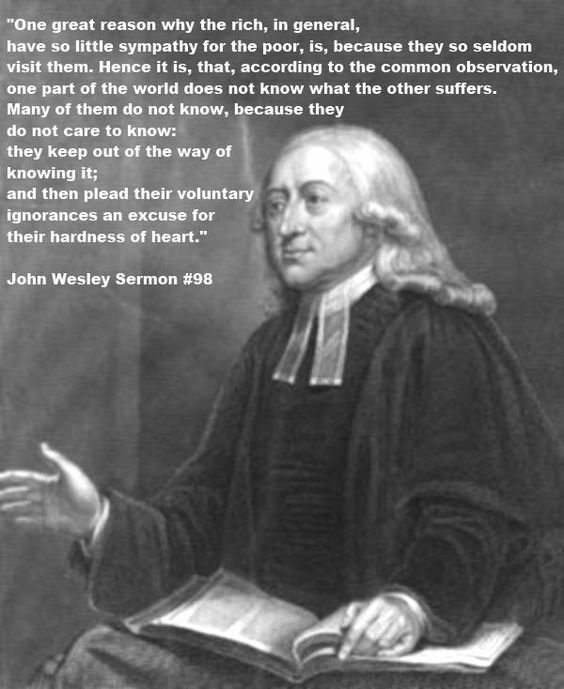 This entry was posted in Hunger & Poverty, Quotes, Spirituality & Religious Writings, Uncategorized and tagged caring, compassion., empathy, hardness of heart, ignorance, knowledge, observation, poor, rich, suffering, sympathy, truth, wealthy, Wesley, world on July 20, 2017 by Ray Buchanan.